The Jeep Wrangler debuted in 1986 as a 1987 model and served as a replacement to the iconic Jeep CJ series. The first generation Jeep Wrangler YJ was designed by the American Motors Corporation (AMC) and released to the public just before the 1987 buyout by the Chrysler Corporation. The replacement for the YJ, the all-new Wrangler TJ, was introduced in the spring of 1996 as a 1997 model. The Jeep Wrangler TJ is easy to distinguish from earlier YJ Wranglers as it no longer used the often criticized square headlights. Instead the TJ returned to the classic round headlights of the earlier Jeep CJ series. Engine options for the Jeep Wrangler TJ were carried over from the YJ series and included the venerable AMC 242 4.0L inline six-cylinder engine. The AMC 242 4.0L inline six-cylinder engine found in 1997 to 2006 Jeep Wrangler TJ models is known for being nearly indestructible. However, the AMC 242 4.0L inline six-cylinder engine wasn’t known for being overly powerful. Rated 190 horsepower and 235 lb-ft of torque the AMC 242 4.0L inline six-cylinder engine pulled like a tractor and could be short shifted like a diesel. 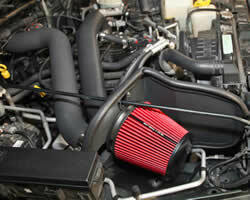 Spectre Performance engineers have a soft spot for the old 1997-2006 Wrangler TJ 4.0L. 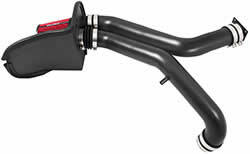 Spectre air intake designers put special consideration into the function and design of the 1997-2006 Jeep Wrangler TJ 4.0L Spectre Performance air intake system, number 9050. The most noticeable difference in design of Spectre 1997-2006 Jeep Wrangler 4.0L air intake 9050 is the inclusion of dual textured black powder coated aluminum intake tubes. At first glance this seems odd to anyone familiar with the Wrangler and its AMC 242 4.0L inline six-cylinder engine. However, the answer is simple. The second tube leading to the Wrangler TJ cowl is an additional fresh air source. Cooler air has a greater density, and a cooler denser air charge can promote more efficient combustion which can help produce more power. The use of the fresh air inlet requires a 3” hole saw to cut a hole in the Wrangler’s cowl and will provide an aggressive tone. Further preventing the ingestion of hot under hood air is the matching black powder coated application specific air filter heat shield. The air filter heat shield found in Spectre 1997-2006 Jeep Wrangler 4.0L air intake 9050 uses a rubber edge trim to better seal against the hood of 1997-2006 Jeep Wrangler TJ models. At the heart of this Spectre Performance air intake system is a High Performance Racing (HPR) pre-dyed red synthetic air filter designed to provide high airflow without sacrificing engine protection. Spectre HPR conical air filters can be washed and reused by utilizing the Spectre Performance Accucharge cleaning kit, part number 884820. 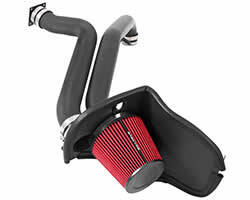 The Spectre Performance 1997-2006 Jeep Wrangler 4.0L performance intake system includes all necessary components and can be installed using basic hand tools in a short 90-minutes in the comfort of a garage or even in a driveway. Additionally, purchasers of Spectre Performance products can rest assured knowing that Spectre Performance warrants its products to be free from workmanship and material defects with a limited 90 day warranty. Since 1983 Spectre Performance has designed and offered unique, innovative, parts and components to fuel your car or truck obsession. Whether your fixation happens to be a classic muscle car or modern pickup truck, Spectre will help fuel your passion for performance. Please visit the Spectre Jeep Wrangler Air Intakes, Spectre Jeep TJ Air Intakes, or Spectre Air Filters for the Jeep Wrangler page, for additional Jeep Wrangler performance upgrades, or browse the wide array of custom Spectre Performance products. If assistance is required please feel free to call Spectre Performance at 909-673-9800.